Here at the Coffee Compass, alcohol consumption isn’t really our bag. Michael is blessed with Celiac Disease, and Stephen simply abstains. This doesn’t mean that we don’t know craft beer when we see it (or rather, when we overhear someone talking about it, hear that a local brewpub is serving it, and then thereafter — like all things — we google it). I jumped at the chance to consume the world’s first coffee IPA – Mikkeller Koppi Coffee IPA Tomahawk Guji Natural at one of my favorite local pubs. Now, if you are like most people and you don’t hear Stout or Porter in the name, you are probably confused as to why anyone would add coffee. But when any coffee aficionado hears “Guji” (s)he knows this coffee is from the Sidamo region in Ethiopia and that it is known for its sweet, berry notes. Koppi is an acclaimed Swedish coffee roaster and like most Scandinavian roasters is known for their lighter roast profiles, which makes for a natural pairing with a lighter beer. As our first beer tasting, we decided to use the methods by which one would taste coffee – Aroma, Taste, Mouthfeel, Finish. I sat down with Sunergos Coffee barista Kenny Smith, and Four Pegs Beer Lounge bartender David Butterworth to enjoy and evaluate this beer. Aroma: Right from the pour, we were surprised. The complexion is similar to a thick, golden cider. The scent is reminiscent of dried fruit – particularly apricots and cherries. 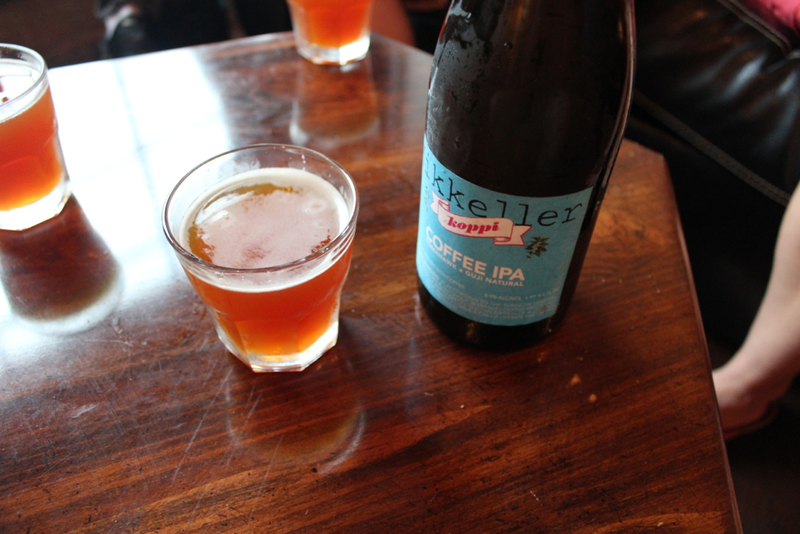 Taste: The coffee taste is light and subtle and goes with the multiple layers of hops. Most notable are the floral hops that surprisingly don’t evoke any hints of honey (floral and honey most always go together). No, the beer has a roasted flavor akin to caramel with a prominent grapefruit acidity. The acidity and citrus notes become more prominent as the beer warms. Mouthfeel: Thin, crisp, and clean when chilled, while REALLY syrupy in its viscosity and sweet when brought into equilibrium with the surrounding room (always an attribute of good coffee).